As-salamu alaykum and hello everyone ♡. For those who didn’t read my previous post, let me recap what I received: yes, an SK-II Pitera Essence Set! The clear-bottle essence that is raved by every beauty lover. So, before I get in depth on it, I went to The Gardens, Isetan to get my skin tested and analyzed. I bet all of you are familiar and know where SK-II counter is. So, did you know they have this Magic Ring Skin Test? This is a 5D Skin analysis machine. This is my first time experiencing a 5D skin analysis and I am pretty excited about it. When the test is conducted, don’t be afraid! You don't have to remove your make up. I kept mine on when I had my skin tested. 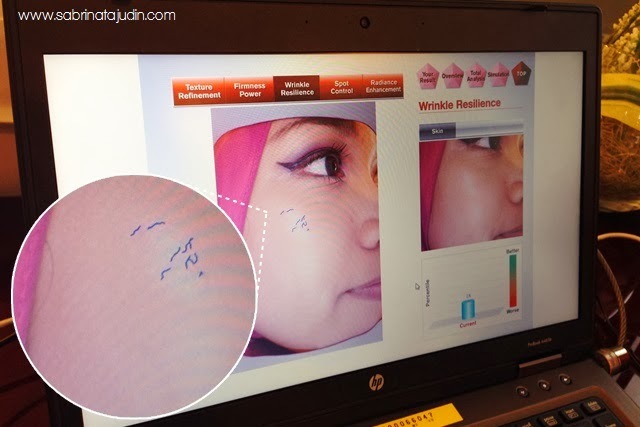 The machine can deeply detect your skin! The Magic Ring Skin Test. Featuring this magic machine that can analyze 5 dimensions of your skin. The dimensions are: Texture Refinement, Firmness Power, Wrinkle Resilience, Spot Control and Radiance Enhancement. It is this high-tech looking machine and it does not hurt okay. Haha. This machine can help detect the age of your skin and what problems you may have currently. I arrived at the counter and I asked the SK-II consultant if I can do the Magic Ring Skin Test and she welcomes me politely. Thank you! The skin analysis only takes around 10 minutes. The consultant asked me to sit down comfortably and asked me to hold back my hijab a bit so that she can analyze my skin area properly. She held the red device on to my face at the cheek area for a few seconds. A small dim light captured a screen of my skin. Then all the data is transferred to the computer for results. It is fast! Then she marked the section of my skin. Jeng Jeng Jeng. Now the results! The highest is Spot Control! Alhamdulilah! Hehe, my spots are not the main problem for my skin actually! And below are the result and explanation on each dimension of mine. Then, Firmness Power. For firmness it looks for skin that is more energized, with firmer contour/curves, more lifting impression on the eye and mouth corners, and less visible laugh lines. In my case, my firmness power is still not that good. I have no doubt on this as I admit that I have been so rough with my skin and lack sleep! The third one is the Wrinkle Resilience dimension. This dimension looks out for fine lines, dynamic line with expression, static lines/wrinkles and connected lines. I have more concentrated wrinkles near my eyes. I have a bad bad bad eye bag problem and this may affect the area near my eye. I have this line under my eyes and a lil sagging problem. This is true! Well I need to take care from now. The highest dimension I scored? The Spot Control. This covers brown spots, brown patches, tone and stubborn spots. Glad I don't have this problem... YET! See that red spots mark on the computer result? Those are potential spots hiding behind my skin. If I don't take care of my skin properly, it will become a pigmentation and well... I don't want that! I got a good score on this and I should make it better. The last one is Radiance Enhancement. This is scaled on translucency, radiance, glow from within, and skin that is less yellowish & dullness. Hmm, I was born with yellow skin tone! Hehe. I wish I can have more radiant skin tone! Lastly the beauty consultant showed me something cool. 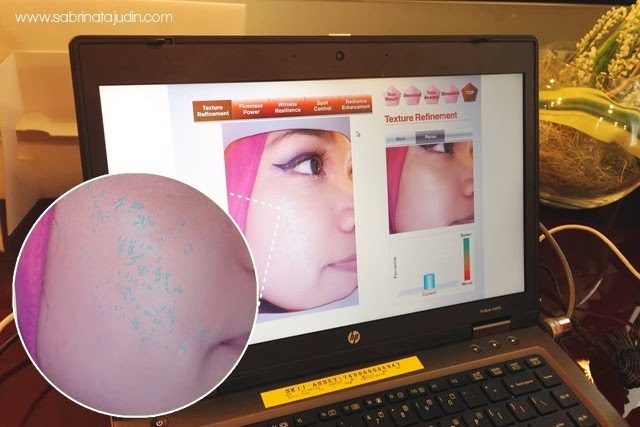 The test allows me to see my “current skin”, "future better skin" or "future worse skin". So the first image shows my better skin if I take good care of it with proper skincare routine and product. This shows more radiance and supple skin finish. The second picture show my worse skin if I don't take care of my skin! I don't want my skin to look like that! I got this in my previous post! So this is the signature product and can help to penetrate my skin better. It may help to solve my all of my 5 dimension problem! So this is essential! Claims to be: Containing more than 90% Pitera™, this much loved miracle water is a must-have for healthy, radiant skin. It helps maintain the skin's natural renewal cycle to its optimum condition to allow skin nourishment. It also works to balance the skin's pH and sebum secretion, so oily and dry areas are properly moisturized. This is recommended for my skin to solve my low score dimension to improve texture, firmness and reduce wrinkles. Claims to be: Formulated with the revolutionary Stem-Acanax Complex that penetrates deep to improve skin from within. Pores become less visible in 1 day. Improves radical firmness in 10 days. This will help improve skin radiance as well as with spot prevention. Claims to be: The SK-II Cellumination Essence EX utilises the Pixel White™ whitening ingredient to improve your skin from the cellular level. Experience highly defined, aura bright skin in just 4 weeks. I am looking forward to trying my starter set and hope it will bring good results! Look out for my posts detailing my month using SK-II. Have you tried the SK-II Magic Ring Test? Please share your experiences with me! haha! don't say that but who know it will better than 37? i pn terkejut to the result, tp mmg btul la, i was so stress with my fyp and all that. haha, jgn la ckp cm tu... welcome dear! Waaaa....27 thn? ?klo iqa bwat ntah bape ntah...but Sab mmg cute pown...mcm 18years old teenagers...best nye test nih...nk bwat jgak..
hehe.. g la check, nnti dia bg good recommendation and consultation..
Wow, cool. Muka I pun teruk gilaaa. Takde masa sangat nak jaga. haha. Thank you Yasmin. From what I know, its free! ^^ just go to the counter and ask for the beauty consultant assistance. said you wanna check your skin with the magic ring test. after the ring test she will then recommend you all the products you need for your skin. Hello. May I know the price for the starter set ?